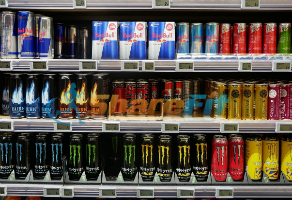 Sugar Free Energy Drinks: Yea or Nay? Feeling sluggish or in need of an afternoon pick me up? Dragging on your way to work? Need to pull an all-nighter in preparation for a big exam? If a serious yawnfest or need for a big productivity boost has you reaching for an energy drink, you might want to press “pause”. Each year, there are more than 20,000 documented cases of hospitalization related to energy drink consumption, with 1 in 10 hospitalizations serious enough to require an extended stay. The energy drink market is an extremely lucrative one, with product manufacturers capitalizing on a populated that is overscheduled and under-rested. Energy drinks run the gamut from “natural” and/or sugar free energy beverages and shots to high-sugar, high caffeine options. But are any of them truly healthy? Common ingredients found in energy products (drinks and shots) include caffeine, guarana (another form of caffeine), sugar, taurina, ginseng, B vitamins, and carnitine. While levels of the aforementioned ingredients vary, we’ve rounded up some stats on the most popular beverages below, a single can of Red Bull (a popular option) contains more than a single day’s worth of sugar. A Rockstar energy drink contains more than two and a half days! As the obesity epidemic has unfolded, the role of sugar in body weight has become increasingly well studied, leading many consumers to adopt lower sugar diets. In response, product manufacturers have begun to offer additional low or no sugar product lines- energy drinks included. While research is ongoing on the health-related concerns association with energy drink consumption, studies have shown that regular consumption may increase risk for heart disease, atherosclerosis, stroke, seizures, obesity, and diabetes. While researchers aren’t entirely sure why, one likely scenario is the effect of large amounts of caffeine on blood pressure and stress response- both of which increase the risk for the aforementioned conditions. Unlike soda, coffee, or other caffeinated beverages, certain energy products are not considered a food product by the FDA: instead, the energy components of these products often fall under the class of dietary supplements, which are unregulated. As a result, the ingredients listed on nutritional labels are often misleading, with concentrations of sugar, caffeine, or other ingredients potentially much higher or lower than indicated on product packaging. Regardless of whether your favorite energy product is full or no sugar, skip it in favor of a natural energy booster: a good night of sleep.